Jack O’Connell (the lead in Angelina Jolie’s upcoming Unbroken) plays Eric, a troubled 19 year old youth from London reassigned to an adult prison for his aggressive behavior. While making enemies of the guards as well as his fellow inmates, he comes face to face with the one man who may be able to soften him — his dad. Eric’s father, Nev (Ben Mendelsohn) is a powerful person in the prisoner hierarchy. Also trying to get through to the boy is a psychiatrist named Oliver (Rupert Friend). A man whose peaceful “let’s talk it out” methods aren’t entirely embraced by the authorities in charge. Starred Up is written by Jonathan Asser, a real therapist turned screenwriter. The account is based on his “encounter groups” for problem cases at Wandsworth Prison in London where he attempted to pacify violent criminals. Right from the beginning, our protagonist is manufacturing a shank only seconds after entering his jail cell. Shortly thereafter he brutally assaults an innocent inmate. Director David Mackenzie does two things really well. First perfectly establishes the character. Then he details his temperament to everyone around him. It’s a captivating watch, Yes it’s a gritty portrait, but Starred Up isn’t the most brutal display of incarceration I‘ve ever seen. (The HBO TV series Oz and those jail sequences in American History X come to mind.) Although it could possibly be the most corrupt view. There are a lot of unchecked abuses going on in this joint. At first I thought the penitentiary’s main kingpin Spencer (Peter Ferdinando) was an employee there because he had so much power. Convicts regularly get in altercations with nary a warden in sight. Perhaps that’s just as well since the guards seem to be more of a threat to the inmates than their fellow detainees. Starred Up is extremely solid. The validity of Jonathan Asser’s screenplay comes through in every scene. Not just in handling the atmosphere with sincerity, but for extracting genuine emotion. Ben Mendelsohn and Jack O’Connell are extraordinarily good. Their interaction is infused with subtlety and nuance. As his estranged father, Nev tries to give his son some life lessons to help him from becoming a permanent resident there. It’s a real father-son relationship as opposed to a metaphorical one. I don’t see that often in this setting. They act the roles to perfection. I suggest a primer on British prison slang prior to watching, however, starting with that title. 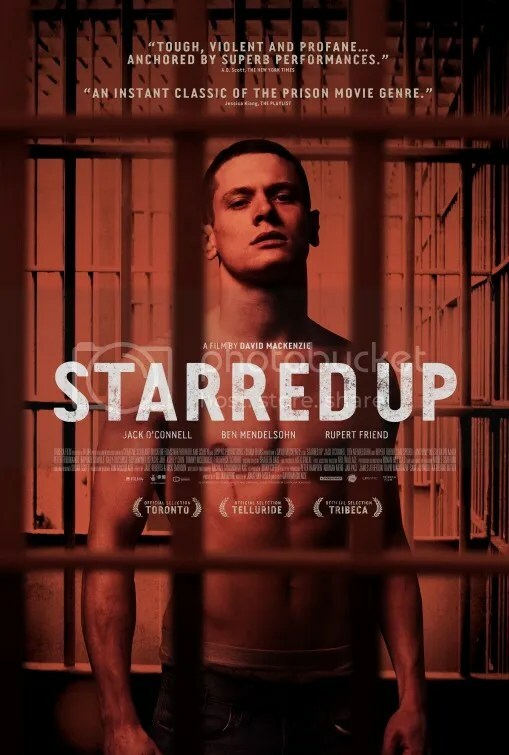 Starred up refers to young offenders whose conduct is so violent that they’re prematurely transferred from a juvenile institution to an adult one. Gwap is money, prison officers are kangas, and to mug off is to show disrespect. All of this makes the dialogue a little inscrutable, but I wouldn’t have it any other way. The authenticity is appreciated and it adds to what makes Starred Up the credible drama that it is. This entry was posted on September 15, 2014 at 8:44 pm and is filed under Drama with tags 2014. You can follow any responses to this entry through the RSS 2.0 feed. You can leave a response, or trackback from your own site. I sadly missed Starred Up when it came out, I will seek it out based on your recommendation! Ok Andy. Let me know what you think when you do. Hope you enjoy. I finally saw this last night. While I was impressed with the authenticity of the prison environment and the acting I felt it was just a series of contrived random fights punctuated with shouting matches. I can see why people have taken to it, but most of the time I just didn’t really care too much about where the plot was going and there should’ve been much more emphasis on the relationship between Eric and Oliver, but we only got glimpses of this. Jack O’Connell is a superb actor though and I’m really looking forward to Unbroken. Often there is an older prisoner that becomes a de facto father figure. Here we have Eric and his actual biological father. I responded to that relationship. I just didn’t think this movie was well-written. For example, where was the father going in the very final scene? That final scene felt too contrived and manipulative for the emotion it’s supposed to invoke. The warden guy or whatever he was felt too cartoonish in his villainy. The reactions of some of the guards made no sense in almost every scene. I know this is set in the UK, so I’m not sure about the penal system there, but here in the US, the number of black people who are incarcerated as compared to white people is unjust, but yet the focus here is yet again on white inmates, while we barely get to know the black inmates. Given the rate of incarceration, you’re more likely to see black fathers and black sons in prisons together, even though in HBO’s ‘Oz’, JK Simmons’ character did have his son in prison too. Mendelsohn is good, but he’s like a puppet on a string. I don’t get why he attended his son’s group only to explode two seconds into it? Jack O’Connell was no greater than so many other young British actors who have done roles like this. I think it was Ralph Waldo Emerson who said “Life is a journey, not a destination.“ That pretty much sums up my interest throughout the entire the film. The father-son dynamic was what captivated me and the final scene was just a way to end a strong drama. There are many stories to tell in a prison. Jonathan Asser chose to write about the tribulations of this young man. I found nothing abhorrent about the focus. In fact quite the contrary, it was mesmerizing. Probably why the writer won the award for Best British Newcomer at the London Film Festival. Sterling report sir. Having only just come into reading a couple of these reviews, my excitement for Starred Up has risen ridiculously fast. I can’t wait to see it, esp b/c I’m really becoming a big fan of what Ben Mendelsohn is doing. Ben Mendelsohn is starting to amass quite a résumé. Have you seen Animal Kingdom? He was extraordinary in that. Since English isn’t my first language I has to turn the subtitles on as there was way too much slang to make sense of it all. Good movie though and like you I liked the way it depicted that father son relationship. Wow even with the subtitles it was still pretty hard understand the lingo. The basic meaning still comes through. I liked Starred Up but I wanted to see so much more of the group therapy sessions. I really think Jack O’Connell is going to be a big star. He’ll soon get that chance with his starring role in Unbroken. It may not be your cup of tea, but people seem to really like it. Yeah for British slang, see this and then watch Attack the Block, one of the best movies of 2011. Nice work here Mark. I really enjoyed this film as well, but man, your suggestion of a British prison slang primer is definitely not lost on me. I almost wish I had the chance to watch this with subtitles on. Ha. But still, a damn solid film all told. Thanks! I usually favor films in a theater on the big screen even when they’re available On-Demand. This was one of the rare cases where watching it on TV with closed captioning (for a movie in English movie no less!) was actually preferable. Never heard of this. Will have to check out soon! It’s On-Demand. I would highly recommend it to you especially. Nice. Looking forward to your Equalizer review. I loved it! Thought it was Denzel’s best film since “Man on Fire”. Oh another reason to anticipate Unbroken. The script was cowritten by the Cohen brothers.